A word formed by the addition of the German infinitive suffix to the Latin "ora" (="pray"). which was very familiar to every one in the Middle Ages, as it still is in Catholic countries, from its repeated use in the frequent litanies of the Church. "Oren" is used by Jews of German descent not so much to signify "to pray" as "to say one's prayers"; that is, to recite a set form of dévotions, whether with the congregation or in domestic privacy. 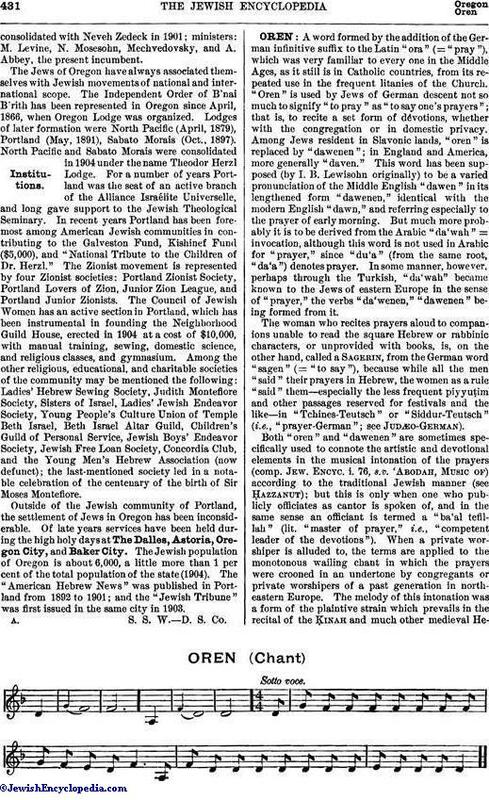 Among Jews resident in Slavonic lands, "oren" is replaced by "dawenen"; in England and America, more generally "daven." This word has been supposed (by I. B. Lewisohn originally) to be a varied pronunciation of the Middle English "dawen" in its lengthened form "dawenen," identical with the modern English "dawn," and referring especially to the prayer of early morning. But much more probably it is to be derived from the Arabic "da'wah" = invocation, although this word is not used in Arabic for "prayer," since "du'a" (from the same root, "da'a")denotes prayer. 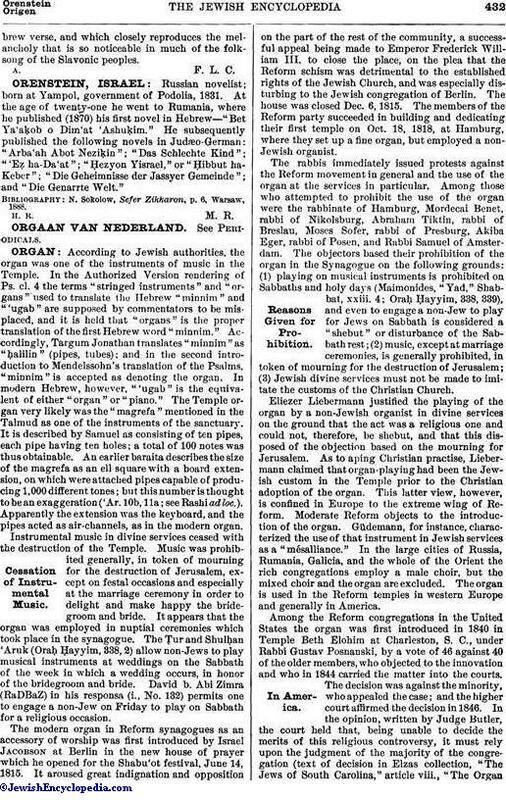 In some manner, however, perhaps through the Turkish, "da'wah" became known to the Jews of eastern Europe in the sense of "prayer," the verbs "da'wenen," "dawenen" being formed from it. The woman who recites prayers aloud to companions unable to read the square Hebrew or rabbinic characters, or unprovided with books, is, on the other hand, called a Sagerin, from the German word "sagen" (= "to say"), because while all the men "said" their prayers in Hebrew, the women as a rule "said" them—especially the less frequent piyyuṭim and other passages reserved for festivals and the like—in "Tchines-Teutsch" or "Siddur-Teutsch" (i.e., "prayer German"; see Judæo-German). Both "oren" and "dawenen" are sometimes specifically used to connote the artistic and devotional elements in the musical intonation of the prayers (comp. Jew. Encyc. i. 76, s.v. 'Abodah, Music of) according to the traditional Jewish manner (see Ḥazzanut); but this is only when one who publicly officiates as cantor is spoken of, and in the same sense an officiant is termed a "ba'al tefillah" (lit. "master of prayer," i.e., "competent leader of the devotions"). When a private worshiper is alluded to, the terms are applied to the monotonous wailing chant in which the prayers were crooned in an undertone by congregants or private worshipers of a past generation in northeastern Europe. The melody of this intonation was a form of the plaintive strain which prevails in the recital of the Ḳinah and much other medieval Hebrewverse, and which, closely reproduces the melancholy that is so noticeable in much of the folk-song of the Slavonic peoples.